For the next four years, the semifinals and finals of the Colonial Athletic Association Tournament will be televised on CBS Sports Network. 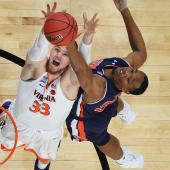 The conference and the network jointly announced Tuesday a four-year renewal, meaning the CAA's automatic-bid representative to the NCAA Tournament will be determined on CBS Sports Network through 2021. This deal comes after CBS Sports Network televised the CAA title game for the first time last season. The tournament's dates are being moved in order to increase its presence. The CAA tourney will now be started on a Saturday and wrap up on a Tuesday. Next season, that means March 3-6 at the North Charleston Coliseum, in South Carolina. "The Colonial Athletic Association is pleased to partner with CBS Sports Network to televise the semifinals and championship game of our men's basketball tournament for the next four years," said Joe D'Antonio, the CAA's commissioner. "We are excited to have the conference's signature event aligned with the family of networks that has become synonymous with the NCAA Men's Basketball Championship." UNC Wilmington was the auto-bid winner last season. The CAA has had six different teams win the league tournament over the past seven seasons.